But did you know the story behind the crimson abode upon which the creek found its name? Originally owned by one of the area’s first settlers, it is a sorry story of family division, betrayed love and mysterious death. In the 1860’s Johnny Frecks went off to fight in the civil war, leaving his young wife behind. Poor Johnny died during the War Between the States and his widow took up with and eventually married his younger brother James. Only the “took up with” part apparently started before anyone even knew Johnny had been killed. When the family discovered this infidelity, it banished the lovers. The despondent couple committed suicide and, shortly thereafter, Jonathan Frecks II, father of Johnny and James, died for reasons unknown. The surviving family members abruptly moved far away, leaving the town a pile of money and an empty red house said to be haunted by three despairing ghosts. Every so often, a skeptical buyer makes an attempt to live in the house, but quickly moves out. Except for one tiny problem. When I undertook the usual due diligence to find out more, no one I spoke with had ever heard the story. And this includes the editor of the book on the Bicentennial of Cattaraugus County (Franklinville historian Madelynn “Maddie” Fredrickson), the author of the book’s chapter on the history of Red House (Llewellyn “Hook” France) and the Cattaraugus County Historian (Sharon Fellows). And yet, there is the story, both on Wikipedia1 and on the official website of Cattaraugus County Tourism.2 I didn’t know who to contact at Wikipedia and they have yet to return the message I left at the 800 number provided on the Cattaraugus County Tourism website. But this highlights the challenge posed in writing a book like this. Mind you, I am not a professional historian, nor am I an amateur historian. Heck, for that matter, I can’t remember the last time I even stayed at a Holiday Inn Express. So don’t get too upset when you see all these footnotes. To be honest, they really bug me whenever I read a book that has them. Too often they contain useful information that adds to the experience of the book. Rest easy, dear reader, for I can assure you these footnotes merely contain source document information. That way, if you can’t believe what you read, at least you can read the original material (in many cases, freely available on the web). The point of the Red House folklore, though, is not merely to reinforce the warning to be wary of anything you read on the internet or to explain why this book has so many footnotes. Rather, the ghost story represents a metaphor for the two prongs of pessimism habitually associated with Greater Western New York. First, it’s a pessimism that seemingly prefers to live in a past that never was. For example, Fellows told me she researched the name “Frecks” and found not land owner by that name. Indeed, the only “John Frecks” who served in the Civil War enlisted in New York City, and he deserted. Worse, even when true we hear a lot about past achievements in a tenor suggesting we’ll never again attain those heights. Take Red House, for example. The town’s claim to fame is its population. Red House has very few permanent residents because the vast bulk of the town was consigned to the Allegany State Park by New York State in 1921. In 2007, Allegany State Park was named one of the top 100 “Amazing Spots” by Reserve America, a camping reservations provider operating in the 48 contiguous states.3 Much of the rest of the town is taken up by the Allegany Indian Reservation. According to the 2010 U.S. Census, the Town of Red House has 38 inhabitants. This makes it the smallest town (by population) in the entire state of New York. Did you know that? And this fact brings up our second metaphorical prong of pessimism. That same U.S. Census has for decades now emphasized our ever diminishing stature. By the end of the nineteenth century, Buffalo’s city rank peaked at #8 in the nation and Rochester wasn’t too far behind at #24.4 The latest census data shows Buffalo has slipped to #72 and Rochester barely hangs on to the top 100 at #100.5 No wonder some see us as a “small” market. Well, that’s certainly one way to look at it. Not me, though. I explain why in a later chapter. So, you can see, there’s a perhaps less well known – but true – story within our first hidden gem. Before we get too far into our story, though, perchance it makes sense to start at the very beginning of this journey, namely, what motivated me to take such joy in sharing these trinkets. My mother and her relatives grew up in the Red House area. The story I was told (when no longer a “child”) was that the “red house” was actually a brothel/bar that the lumberjacks used to visit. But then I was also told that the uncle that my parents bought the house I grew up in from such a clever moonshiner during prohibition that he had literally built a still within the house on Big Bone Run in Southvalley. Supposedly my mother axed the still and buried the copper some place in the woods behind the house. Thank you for your input on this mostly forgotten part of NY. My grandmother grew up at Red House where her father was station agent for the Atlantic & Great Western RR. After finishing school herself, she was hired to teach at the Indian school. She moved to Cleveland, OH, married and raised two sons and a daughter. My brother and I drove there some years ago to find where the A&GW station had been and to try to locate where the school house had been. We drove the abandoned road from Randolph, NY and arrived at the bridge over the river. We knew that more than one RR had run through Red House and found the ballast (no rails or ties! ), but no site that could have been the station’s location. We crossed the bridge and were standing in the triangle there when a car drove up and an Indian woman asked if she could help. In all of the time we had spent there, we could find no evidence of buildings or a RR. She told us we were standing on the apron of a gas station that had been there and offered to show us the site for the Indian school. It was a relatively short distance down Jimmerstown Road and only the poured concrete steps were left to show that anything had ever been there. I’ve used various maps to locate both the school and the station, but doubt I could find the station which is supposed to be at the 7.7 mile post from Salamanca. Interestingly, there are two photos of the Red House station, one taken from each end allowing the four sides of the building to be seen. I just finished watching a short movie taken by someone wandering all over the town. At about 6 minutes, he shows the concrete steps of the school house, but doesn’t know what they are. Interesting none the less. My ex husband was the Postmaster at Red House, New York, which handled a large volume of mail for the Allegany State Park. It was located in Costello’s Grocery Store, which was operated by his mother. It was located across from the gas station owned by Orville France, Jr. The store also had a gas pump. All these businesses, including the Post Office and the school were closed by the Corps of Engineers to construct the Kinzua Dam down river. The population of the Town of Red House was larger at that time. I have a mystery about Red House. My Cousin Albert (Burt) Abbey lived at Red House in 1900 (Census). Had two children Clinton and Violet and wife Pearl Carpenter. By 1910 they had disappeared, as the children were adopted out. Did the parents die in a fire, or did they take off for parts unknown..?? It was my ancestors, the Frink family, who were the original settlers of Red House. It’s the birthplace of my grandmother. The Frink family are very well known New York state original pioneers. 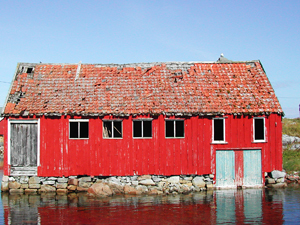 Red House was used as a marker for the loggers and rivermen so they knew how far down the river they were. edited by William Richard Cutter page 1444-1445. They are related by marriage to many of the old, founding families of New York State including the Bigelow, Hale, Burt and many, many others. There are no descendants I am aware of that match any old ghost stories. Red House is a great landmark, it’s too bad that it wasn’t preserved, it helped build Western New York. Pamela: Thanks for sharing! Good luck on your research. Today, I found the funeral program of my great great grandmother who was born and died in Red House – 1855 to 1940. And, today would be her birthday! My grandfather, William Henry Milks and his family were from Red House. They moved on to Montana in the early 1900s. Would love to visit the area one day.